If I was writing this review back when I’d read this book the first time, I would have given it a firm 5 stars and been proselytizing it all over the place. It was the first urban fantasy I’d ever encountered, and the story really got me as a college aged writing major. With that being said, I did a close-read on it for my MFA, and d*mn those close readings for ruining a book I have such fond memories of! This is not to say Bull’s craft is bad; it’s not…it’s actually quite brilliant, and her character development is on par with Gaiman and Pratchett. But because I was focusing on the craft, I found myself incredibly disenchanted by the plot during the second read, and really didn’t want to finish the book. I would really like to blame this occurrence on the fact that this story is all about the reveal, so since I knew what was coming, the book lost some of its charm, and became a little boring. The War for the Oaks is set in 1980s Minneapolis, and the Faerie Courts are planning on hosting a war in the city, but they need a mortal to be on the scene of the battlefield in order to break the spell of immortality for the event. Eddie McCandry is an aspiring rock-and-roller who’s selected by the Faerie court to be their ‘mortal,’ and she soon finds herself in constant danger, and becomes unwittingly attached to her body-guard, the Phouka, as she learns about Faerie and the war that’s pulling the world apart. There are many nice things about this book; Bull does an awesome job of weaving the world of the Faeries into the real Minneapolis, and her descriptions and knowledge of Fae lore are impressive. But some of the plot comes off as cliché, and a lot of the themes and references are very 1980s, and don’t hold up some thirty years later. Also, just for Ms. Julien, I’ve removed a half star for the poor fashion choices in this novel. 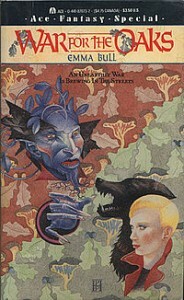 Granted, it’s a product of its time and was published in 1987, but the clothing in this story has serious representation power for the characters, and since we as readers have become so far removed from the popular styles of the 80s, the fashion choices in this novel have not helped the story age gracefully. If anything, if they’ve detracted from the characters and make them seem a bit foolish. Even though I’m only giving this a 2.5 for its inability to transcend the 80s, the core story and good writing in this novel will still be near and dear to my heart. Share the post "Welcome to the 80s"
Drug Trip or Wacky Plot….Who Can Say? This made me go back and revisit my own review, because I remembered liking this book but not considering it a favorite. Consider me tickled to discover that I, too, mentioned how the dutiful transcription of everyone’s 80’s fashion brought the book down a notch for me! I’m glad it wasn’t just me! I just couldn’t take the Faerie queen seriously running around in silver shoe booties and 80s pleated mom-slacks. Did you review it for CBR7? But really, though. So many slacks. I read this back in high school and I remember loving it then, but I have never revisited it since. It sounds like it’s best to leave it to the past and keep my happy memories. Oh the fashions. I read it um… ten or so years ago? So still, long after the 80s. But it’s one of the books that made me realize how much talking about clothing can date a book and make it passé instead of on point, even more then technology in some respects. I suppose in a century or two, if the book is still around, they won’t affect the book in such a negative way but right now it’s hard to take 80s fashion seriously. I will say in defense of the book that the reason it’s seems cliché ridden is that so many, MANY people copied War for the Oaks and so it became the breeding ground for many modern urban fantasy clichés. But, as I didn’t read it in the 80s they bothered me as well. I read it long after my introduction to Urban Fantasy and still enjoyed it. But I read it because it was supposed to be a groundbreaking Urban Fantasy novel, one that had influenced the books that came after, so I went into it with that in mind. And I found that it was still enjoyable and held up. However, Moonheart by Charles de Lint, which is a similar groundbreaking Urban Fantasy novel in that people tout it as being a huge influence on their works, did not hold up as well for me. I found it boring and wasn’t really interested at all. Now I normally love Charles de Lint, so it was kind of weird to think that his ‘groundbreaking’ novel didn’t work for me. I think reading a lot of ‘ground breaking’ novels after they’ve broken ground tends to be a let-down. Either they’ve been so touted that we go in with really high expectations, or like you mentioned with “war of the oaks”, other authors have stolen from the ideas so much, that the original ends up seeming like the trope. I often feel like a lot of the classics of the genre end up falling flat for me because i’ve read too many of the things that came after them first. I also think the realm of fantasy writing, urban or otherwise, has greatly enhanced since the 70s and 80s, which means we as 21st century readers go into these books with a higher standard of expectation than readers may have been doing 20 years ago. Halbs on “Do we settle for the world as it is, or do we work for the world as it should be?”I LOVE that title quote. The Mama on Dear Mr. Pretend Henshaw:Oh man. I LOVED this book. Like, LOVED IT.